In October of 1993, Mia Schaikewitz was 15 years old and a rising star on her high school swim team. She was training for a new season when suddenly one evening she found herself unable to move her legs. Within 12 hours, doctors discovered that an Arteriovenous Malformation (AVM) had ruptured in her spinal cord, leaving her paralyzed from the waist down. With resilient determination and a positive attitude, she moved forward to pursue her life goals. Mia finished high school and then attended the University of Florida where she excelled socially and academically, becoming the first woman in a wheelchair at the school to rush and pledge a sorority and graduated with a top honors in Media Production. After college, Mia moved to Los Angeles where she worked in the recording industry and later developed an award-winning career in graphic design and branding. In 2012, Mia became one of the stars of the hit TV show Push Girls on the Sundance Channel which inspires audiences internationally and won the Critic's Choice Award for “Best Reality Series” in 2013. In addition to her dynamic career pursuits, Mia is dedicated to raising AVM awareness and is an advocate for diversity inclusion in the workforce and media. She maximizes her time public speaking, giving back to the community, and participating in multiple adaptive sports. She recently returned to her former sport of competitive swimming and lives by her motto, “Believing in yourself means never having to say 'I can't'!” Mia met Marisa at the Media Access Awards in 2014 and grateful to be part of a revolutionary dance project. Adelfo is a competitive bodybuilder and personal trainer / nutritional consultant, passionate about fitness, nutrition, and physical culture, aspiring to be a successful entrepreneur. On November 10, 2005, Adelfo was involved in a deadly car accident which left him paralyzed from the waist down as a T-12 paraplegic. Adelfo was initially torn down spiritually, mentally, and physically following the accident, but after one year, he embraced his physical condition with open arms, and used it as a driving tool to challenge and motivate himself. Adelfo started body building in 2007 after being inspired by a youtube video of guys in wheelchairs posing and flexing at a body building competition. His life has been transformed ever since. Marisa called Adelfo early November 2014 asking if he'd be interested in being her wheelchair dance partner. Adelfo chose to take on the challenge, and is having a blast learning a new form of self-expression. Piotr is one of the most accomplished wheelchair dancers in the world, with multiple wheelchair World Latin Champion titles, including winning 6 World Championships, 5 European Championships, 11 Polish Championships, and a few World Cup crowns, all between 1999-2011. He has performed as a guest artist at some of the most prestigious ballroom dance competitions including German Open, Blackpool (UK), Snowball Classic (Canada), Millenium Dancesport Championships (Florida), and has performed alongside some of the most acclaimed dancers including Michał Malitowski & Joanna Leunis, Ricardo Cocchi & Yulia Zagoruychenko, Hanna Kartunnen & Victor da Silva, and has also appeared in the Romanian Dancing With the Stars. . Piotr has contributed to the popularization of wheelchair dance sport performing and teaching in many countries and inspiring other wheelchair users to dance and pursue their dreams. In 2012, Piotr had to stop competing after a serious surgery and spending 6 months in hospital. Infinite Flow Founder Marisa Hamamoto and Piotr started to exchange messages and phone calls through Facebook Messenger in 2016, sharing information on inclusive dance and exploring the possibility of working together. After finally meeting and performing together in July 2017 in Tokyo, they mutually agreed to continue working and collaborating together. Piotr admires Infinite Flow for its message of inclusion and Marisa’s ability to bring out each person’s beauty, whether they have a disability or not. He feels he finally found a family and community where he can continue to advocate for people with disabilities through dance. Outside of dance, Piotr is a father of 2 kids Kevin & Maya, a pool & fishing enthusiast, and the only person with a disability in Poland who has a license to train police dogs and operate a construction crane. Marisa believes we all have a dancer inside of us and we all can make a difference in the world. Professional Ballroom & Salsa Dancer, Speaker, and the Brain behind Infinite Flow. After 20 years of dancing ballet and contemporary dance in both the US and Japan, Marisa started ballroom dancing while recovering from Spinal Cord Infarction, a severe neurological disease which laid her paralyzed from the neck down. She feels blessed to be back on the dance floor again, and is now dancing and teaching professionally full-time. Marisa founded Infinite Flow in January 2015 as a way of giving back her love for dance, and it is her life mission to help find the dancer inside of each person. Marisa has been featured in various commercials, infomercials, and tv shows, and has performed at hundreds of shows, events, and private parties. Marisa earned both her BA and MA on merit scholarships from Keio University, the “Harvard” of Japan. While in college, Marisa linked her dancing with her academic studies, and researched and published papers in the fields of Dance Science and Dance Education and served on leadership for the International Association for Dance Medicine and Science for 3 years. She was named Newcomer of the Year at the San Fernando Valley Business Journal Women in Business Awards in 2015. Marisa has volunteered 30+ hours weekly since January 2015 to get Infinite Flow off the ground. She is a leader and artist on the rise and has many great plans for the future of Infinite Flow. "Whether you have two left feet or two left wheels, we all have a dancer inside of us"
A native of Los Angeles and professional dancer, actor, and singer, Forres credits include commercials for Jack-in-the-Box and Pepsi, guest appearance on Dancing With the Stars, and dancing in films The Gangster Squad and Hail Caesar. He has performed at hundreds of shows, and is grateful to have been able to step onto the stage at great venues such as the Hollywood Bowl, Alex Theater, The Gerald Ford Theater, among others, and has toured the country as a regular cast member of "Let's Dance! With Jeff Tyzik" as well. As a competitive ballroom dancer, he is two time Open Professional American Smooth Champion and an Open Professional International Latin Champion. He has won competitions in Lindy Hop, Argentine Tango and Salsa as well, and his dance students have placed well at competitions as well. Forrest has a Masters Degree in Opera: Solo Voice Performance, and continues to expand his knowledge and skills, studying with guest artists regularly. He is proud to add wheelchair dancing to his skills and repertory. In 1992 Auti Angel, a professional dancer on her way to stardom, faced devastation when she experienced a life threatening auto accident that left her paralyzed from the waist down. However, through years of many trials, Auti Angel has been able to reinvent herself as the shinning star she is. Auti Angel has experienced life’s challenges that would later become her tool to help mentor others through their struggles. 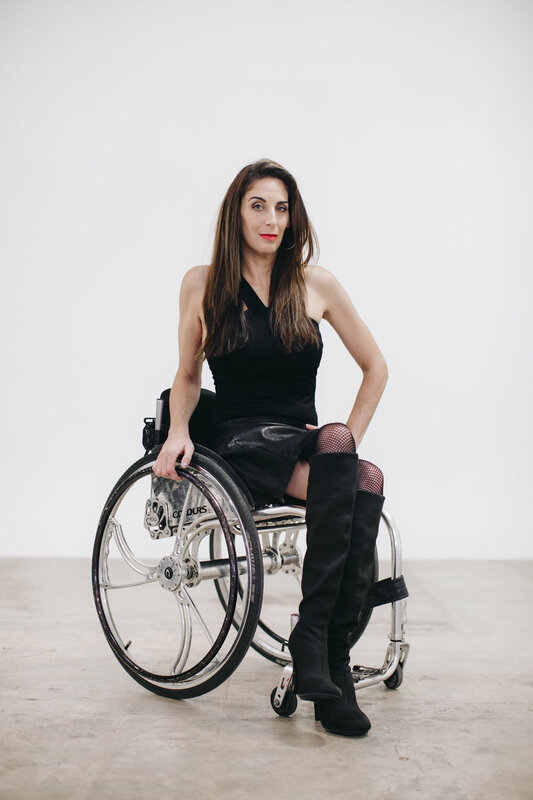 Returning to her first love of dance, she pioneered wheelchair hip-hop dancing worldwide and has continued to pursue her career in music and acting; showing this industry that she is Unstoppable! Auti Angel is currently one of the stars on the Best Reality Series "Push Girls" (Critics Choice Award winner). In the film "Musical Chairs" on HBO, she not only stars as Nicky, but she also wrote, sang, and co-produced the song “Baile Baile” that is on the soundtrack (availible on iTunes). Auti Angel has been seen on several major TV talk shows sharing her story of triumph over tragedies. She has been featured on... "Good Morning America", "The Marie Osmond Show", "The Jeff Probst Show", "OMG Insider", "Access Hollywood Live", "CNN", "The Katie Couric Show", "Latina Magazine", "US Magazine", "New York Times", "Los Angeles Times", and "Los Angeles Magazine" just to name a few. Auti Angel has become a true symbol of survival and overcoming adversity. She inspires, motivates, and empowers audiences. She shares how perseverance and setting goals have helped her overcome obstacles, embrace change, and how to maintain a productive life. Kima was born and raised in Almaty, Kazakhstan. He trained in Hip Hop, Contemporary, and Jazz Funk, and built a professional dance career in Russia, which included working with Anita Tsoy, Vintage, and Egor Kreed. In 2016, he was granted asylum from the US and left Russia to avoid persecution for his sexual orientation. A few months later in January 2017, Kima lost his lower left leg as a result of an accident but that did not stop him from dancing. He trained hard to stand, walk, and eventually dance with his prosthetic leg. His journey with Infinite Flow began when he was introduced to Marisa via Facebook while recovering from the trauma. It took some time til he was ready to jump back into dancing, but Marisa continued to check in, and in Sept 2017, he finally said yes. Since then, he has been involved in flash mobs, dance videos, and even choreographing for performances. Kima loves collaborating with new friends and posting videos on social media. He is an avid Instagrammer and he hopes to use it as a platform to motivate and spread positivity. Shaheem Sanchez is a talented self-taught dancer who went deaf at the age of 4. Shaheem always loved to dance and wouldn't let his inability to hear the music change that. So, he taught himself how to detect the music's vibrations instead, letting the feeling drive his rhythm. He comes from a family of dancers, who call themselves “Family First Crew”. They competed in Family Dance Off in 2013 and placed second. Sanchez now lives in LA and is pursuing many opportunities in the dance industry. In addition to getting his personal story out to various mediums, he is working on a TV show and a movie. He is out to make a difference in the deaf community through his love of dance. Sanchez wants to demonstrate that regardless of their inability to hear, deaf people can do anything they desire. At the age of one, Natalie was diagnosed with juvenile rheumatoid arthritis, which caused her to lose her vision at the age of 18. As a cheerleader, co-captain of her dance team, and member of the show choir, she never thought she would perform again. But after an almost decade-long hiatus, Natalie was ready to put her dancing shoes back on. Natalie was connected with Marisa through her agent and although Ballroom dance is new to her, Natalie has a blast training and collaborating with other Infinite Flow artists. Natalie is a triple threat who hopes to bring the blind community together through the arts. She is part of Theatre by the Blind and the Blind Dance Company, and is currently recording an EP with another blind producer. Although she has been faced with numerous obstacles throughout her life, Natalie refuses to let her blindness define her and wants to encourage others to take the risk and go after their dreams. Gary coached and choreographed world champions in theater arts. He has danced with the Boston Ballet, American Folk Ballet and Los Angeles Classical Ballet and as a guest artist with multiple ballet companies. Musical credits: Saturday Night Fever (Cezar), Li'l Abner (Evil Eye Fleagle), Contact (Headwaiter), West Side Story (Bernardo), Grand Hotel (Bolero-L.A. Ovation award nominee best featured actor in a musical), Music Man (Tommy Djealus-M.A.C.Y. association award Best Performance in a Musical) Film and TV: The Producers, The Mask, Boys and Girls Guide, Murder She Wrote and Live To Dance.